New retail, fintech products and payment channels are three major focus for Bukalapak this year. Read the original article by Kamila Mulia from KR Asia here. Founded 9 years ago, Indonesia’s newest unicorn Bukalapak (which means to open a stall or shop) has grown beyond its e-commerce origins into a more comprehensive lifestyle app. It started in a humble boarding house in the Indonesian city of Bandung, where three young tech enthusiasts Achmad Zaky, Nugroho Herucahyono, and Fajrin Rasyid began to build an online marketplace with one vision in mind: changing the lives of many people by enabling small & medium enterprises (SME) advance their business through selling online. Today, total transaction or gross merchandise value (GMV) of Bukalapak is reaching IDR4 trillion (US$283 million) per month, co-founder and president of Bukalapak, Fajrin Rasyid told KrASIA. Its closest competitor, the Alibaba-backed Tokopedia, does not disclose GMV figures. The company also says it currently has 4 million merchants and 50 million monthly active users in Indonesia. “Bukalapak has expanded into many things, from virtual products like plane and train tickets to financial products, and investment services. So I think we are more appropriately referred to as a lifestyle app based on e-commerce,” said Rasyid. The company is also no longer targeting the online market only but has also ventured offline by supporting small kiosks or individuals to sell a wider range of products through its Mitra Bukalapak partner programme. Mitra Bukalapak is a separate app for reselling Bukalapak’s various digital products so that buyers who don’t have access to the internet. The resellers earn a commission for every transaction. In addition, by joining Mitra Bukalapak, small kiosks will be connected with Bukalapak’s principal distributors so they are able to buy and manage their stocks more efficiently through the application. Mitra Bukalapak has collaborated with over 500.000 kiosks and 700.000 individual sellers across Indonesia, says Rasyid. “Our purpose is to bridge online and offline retail. Mitra Bukalapak app is designed simply and straightforward so the micro enterprises can use it easily,” he continued. Bukalapak is investing IDR 1 trillion or US$71 million to take traditional kiosk to the next level with this programme. The kiosk empowerment is further supported by a collaboration with the government through a financing programme which allows kiosk owners to get business loans of up to IDR 10 million (US$710) per kiosk, through the Buka Modal feature. The empowerment of kiosks might be described as Indonesia’s version of new retail. Alongside this, Bukalapak has also been growing its suite of financial products. The platform offers financial products including mutual funds, gold trading and is looking to add more. Bukalapak was the first e-commerce platform that recognized the potential for providing a gold trading feature, Buka Emas. In Indonesia, gold investments are considered a safe long-term investment. Buka Emas was quickly accepted by users, with “millions of transactions,” said Rasyid. This year, Bukalapak plans to release more several fintech products, including insurance platform that will be launched in the first quarter of 2019. 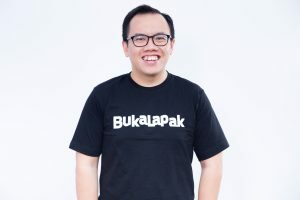 Like its competitor Tokopedia, Bukalapak had plans to launch its own e-wallet (BukaDompet), the development of which was stopped when the Indonesian Central Bank (BI) decided to freeze the issuing of new e-money licenses. To circumvent this, a few months ago, Bukalapak paired up with the wallet of fintech operator DANA, a joint venture by local conglomerate Emtek Grup and Alibaba’s fintech arm Ant Financial. According to Rasyid, the Central Bank is currently discussing new rules regarding electronic money through e-commerce and Bukalapak is participating in the talks. “BukaDompet is still in the process of licensing. We have already submitted all the requirements needed and we surely expect the good news as soon as possible,” he said. Achmad Zaky and Fajrin Rasyid were selected as Endeavor Entrepreneurs at the 63rd International Selection Panel in Dubai in March 2016.